With a glorious cover picture that seems to reach out and grab you, this adventure involves the investigation of a demolished stronghold that leads the party into uncharted depths and face-to-face with a being that the local goblinoid savages hail as a god. Whitefang Stronghold perches high in the mountains guarding a pass - just find a suitable mountain pass in your campaign world, probably something used as a trade route. It's a nicely-designed multi-level building highly appropriate for its situation. However a recent caravan passing through found the garrison slaughtered and even the structure of the stronghold damaged. The party is hired by the local lordling to investigate. Oh, and to find a valuable artefact that had been delivered there recently. The encounter list shows that a lot of the opposition is presented by the local wildlife. There's scaling information should your party be weaker or stronger than that for which the adventure was written, and the interesting point that the first part of the adventure - investigation of the stronghold itself - should not provide a significant challenge to the party: that comes later with the discovery of a nearby underground complex! If your party isn't the sort to hire out to local lordlings, a few alternative ways to get them involved are provided. There's also an extensive backstory that explains in detail how the situation they'll find came to be. It makes for a good story, so do try to weave it in to the adventure to enhance the plotline. The adventure proper starts with the party in the mountain pass, just as they arrive at the remains of the stronghold. The garrison may be dead, but the place isn't deserted. It's all a bit confusing and the party will have to piece events together to discover what actually happened here. Most of the inhabitants want to fight rather than talk (although some are not above the odd taunt), but as noted above, they should not prove impossible to defeat. There are several points where you get handouts to 'show the players what their characters see' although the descriptions themselves convey the scene pretty well. By the time they've scoured the Stronghold, the party should have picked up enough hints to suggest that finding and exploring a nearby cave complex. There's a handy list of clues in case you are having difficulty picking them out: they are rather subtle and you may find it necessary to signpost them a bit to ensure that the party knows where they are supposed to go. There's also a Bardic Knowledge check and even an optional encounter to nudge the party in the right direction if all else fails! Getting there is part of the adventure, with local wildlife and a rockfall to make things difficult, and once there the complex is crawling with wandering monsters. Things only get more difficult from here on in, and there's at least one encounter it might be more prudent to back away from. The cavern ecology is quite fascinating, with several groups in interlocking relationships. Few relish intruders, however, so any attempt to study them will be spoiled by the inevitable fights... but most adventurers come to fight not conduct anthropological studies, so that's no problem. There are three layers, with increasing levels of challenge as you descend... and at the bottom there's the living embodiment of a deity! At least, if you listen to some of the more powerful denizens that's what he is... no matter, he's big and powerful and greets intruders with immediate combat. His tactics are laid out clearly, and it should prove a suitably climactic brawl to end the adventure. Pickings so far have been poor, nut there is plenty of treasure to be had here, as well as the artefact that those parties hired by the local lordling were tasked to find. This makes for a great 'double delve' - Stronghold and caverns - with a lot going on, and certainly lives up to the ideal that all monsters are there to be fought! The way various monstrous races have been used in conjuction with one another is excellent, with creative and believable alliances and relationships that make it all work within the context of this alternate reality. 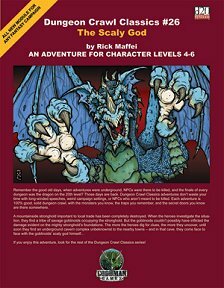 Return to The Scaly God page.